I have a raging obsession with grapefruit. I cannot get enough of it. I peel it like an orange and end up with a mix of pith and sting under my nails from digging too hard. I order the juice in my cocktails, and then I drink it the next morning to quell my hangovers. Earlier this month on my flight back from Vancouver, I watched Paula Deen bake a grapefruit cake on the tiny screen in front of me, and I made a mental note to Google the recipe as soon as we landed. 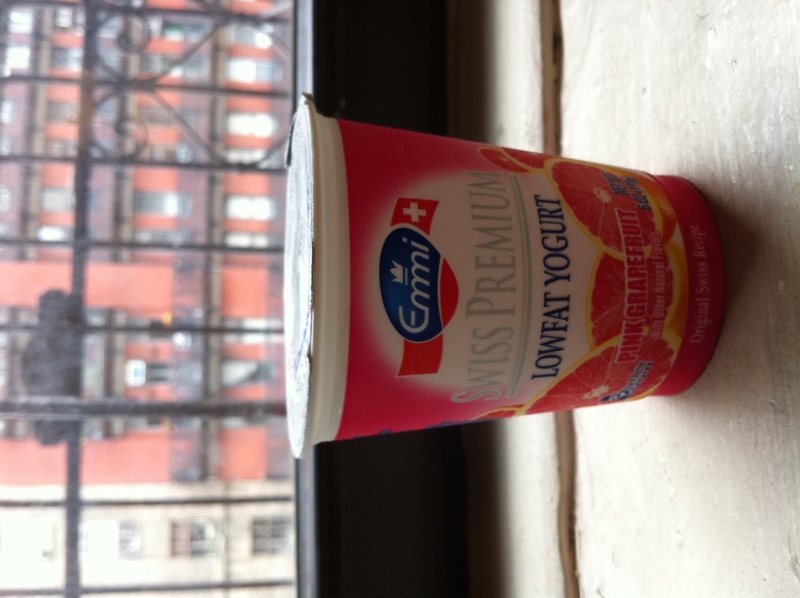 And last week, I tried Emmi’s Pink Grapefruit yogurt for the first time and simply could not believe that I’ve been missing out on this for what appears to be at least 5 years (I found a thread on the Chowhound discussion board about it, dated 2006). Where have I been? I’ll admit that the idea of grapefruit and yogurt initially seemed bizarre. The thought of combining two such distinctly sour flavors made me cringe. Well, it turns out that’s what sugar is for. 27 grams of it, to be exact, and what you end up with in this little container is a magical mix of silky milk, tiny flecks of pink pulp that burst in your mouth, and an uncanny blend of tangy, sweet, tart, and just the tiniest whisper of bitter (to remind you that this is, after all, grapefruit). My probiotic intake is about to skyrocket. my mouth just started to water! i need to find myself some grapefruit yogurt! I adore this post. I’m eating this for brekkie tomorrow! you’re like my taste bud soul sister. report back, please. we grew up on grapefruit cut in half and sprinkled with sugar for breakfast. but grapefruit yogurt? i’m skeptical but so very curious. totally understand your skepticism, mijin! i felt the same way…i didn’t think grapefruit and yogurt belonged together, but it somehow works!! but i think it’s only this brand. i tried siggi’s brand before and it was (sadly) terrible. even more sad is that i don’t think they carry emmi here in the bay 😦 if they do i shall bring you one!